Give your clients the best of both worlds with the Silver Fox Mini Facial Steamer from MassageTools, delivering an amazing facial treatment with the added benefits of aromatherapy. Aromatherapy has been around for ages, using essential oils to improve a person's overall health and mood. You should never place essential oils in a regular facial steamer because it will damage it. However, the Silver Fox FS-100C is equipped with a special compartment designed to administer aromatherapy. When you want to create a beauty spa right in your own home or give your salon or spa clients a little more, try adding in an aromatherapy element with MassageTools' Silver Fox Mini Facial Steamer. 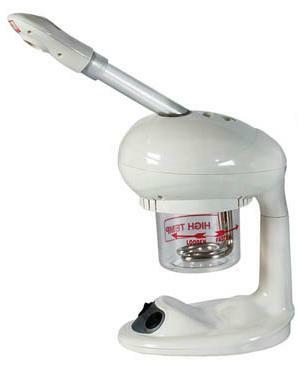 The Silver Fox FS-100C is the ideal home or professional facial steamer. It is portable and provides an abundance of steam that is ideal for deep skin cleansing. The FS-100C is also equipped with an aroma therapy compartment, an extended arm attachment as well as independent steam/ozone switches. You'll have steam in only five minutes. MassageTools' Silver Fox FS-100C must be used on a flat surface only. Aromatherapy has been known to relieve anxiety, boost energy, relieve pain and even help with sleep issues. Try the Silver Fox Mini Facial Steamer at home or inject it into your professional practice and add aromatherapy to the list of options for your clients. - Arm length: 10 1/2"
- Capacity: 12 fl. oz. - Depth of base: 7 1/2"
- Width of base: 6 1/2"
I was not sure this would work for my clients home service treatments. But this machine has proved me wrong. absolutely amazingly strong and efficient. I love how dependable it is and how professional it looks. Great little device. Very professional for a small machine. Perfect for what I needed for. Lots of steam!! The arm is awesome to move like a full size steamer. Very happy with purchase :) on sale was a nice plus! I learned about this product from a friend who has owned one for many years. After she let me try hers, I purchased mine. I didn't know there was a small, portable face steamer available. Very happy with the machine and price! Most importantly, I love the benefits for my skin. My husband also uses it to help his always ailing sinuses! Just add a drop or two of eucalyptus oil. Great facial steamer. I improvised "9 ways to Sunday*," but this is by far hands-down the best. (* #1. Vegetable steamer with towel over my head. #2. Golf-size umbrella overhead in a shower; couldn't get the steam hot enough. #3. Joined a gym with a wet sauna. You name it, I tried it. #4. 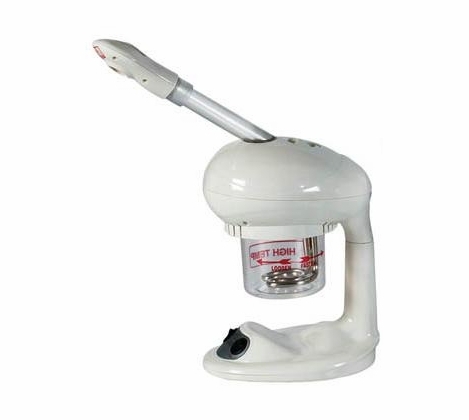 Mini steamer to remove wrinkles from garments; this worked great and travels well. My facial professional referred this to me. THE 2 MOST IMPORTANT THINGS IS THE DISTANCE FROM THE STEAM ACCORDING TO THE SKIN TYPE, and LENGTH OF TIME. If you see a facial professional pay attention to how far they hold it to your face. They know what they're doing, and are trained accordingly. I love my facial steamer. It has been the game changer in my facial ritual. My skin looks smoother, pores are much smaller, and all of my skin care products work more effectively. Others also notice an improvement in my skin texture. I love this steamer. As a professional this little steamer with the extended arm is great. The flow is exceptional and refilling is easy. Highly recommend as a space saver in your treatment room. Great Steamer & Great Service! The service & the steamer were GREAT!!! Very pleased. Good flow of steam that heats up quickly. I mix some witch hazel with distilled water. I use it every day. My complexion has really improved. Very good steam. Just don't like the plastic. The first time I used it I was amazed at all the steam it produces great little machine also aroma therapy compartment for your oils defiantly a plus. It is a good concept for facial steaming and also great for sinus problems. Although there is an option to add scented oil-- it is do it at your own risk. Had a similar mini facial steamer (exact same unit, different brand) and put scented oil and damaged the jar, tubes which rendered it inoperable. Bought this unit and the nozzle broke without even using oil. I am happy as they replaced it free. Manual said nothing about what type of oil to use which should have been stipulated. Ordered extra set of implements just in case. Let's see how long this unit would last being told by the company rep that they never had problems with their unt. Love it! It's just as good as it's said. I recently bought this item and for a small steamer its powerful and handy. I can put it anywhere and do my facial comfortably even by holding it in my hand. I love love it. My face is so clean and smooth eachday . If u looking for a steamer choose this. i am an esthetician. I bought this steamer to fit in my very small facial room. It is perfect! I love that it has an arm extender and there are no annoying beeps. I have used many professional size steamers and this one by far it the quietest. The only thing is that it stinks like new plastic so I think I will run it with some vinegar water. Works just as good as the ones aestheticians use (maybe even better). I use it once a week for 10 minutes. My skin has never looked better. This steamer is amazing! I have super sensitive skin & am prone to breakouts. I had never really found any product that could help until I got this steamer. I use it everyday & the difference in my skin has blown me away!!! It's cleared up all my breakouts, given my skin a healthy glow, softened my skin & even drastically improved my wrinkles. I highly suggest this steamer. My only advice would be to inquire about the certain essential oils that are safe to use. I used one that was too harsh on the plastic & it ruined the steamer head but the customer service is absolutely amazing & they made sure to resolve the issue right away. I'd recommend everyone who can't afford a facial every week to get this!! Do yourself a favor and purchase this steamer. You will love it. It is like having a spa in your own home. Produces lots of steam and is very easy to use. I've been going to spa's for treatments and this machine is perfect for those in-between visits. Great price and great steamer!! Well i have not had a chance to use it yet but thank you for contacting me to find out. This tells me that you care. the little steamer is a perfect size to have in bathroom and remind oneself that it is an easy task to have a nice little pampering of the face. Especially in dry climate like LA my skin noticeably suffered. This steamer is easy to use, was shipped promptly, and I have no complains. My face is happy. It was a good price and after having researched a whole day on amazon and learnt that much more expensive steamers still had too many negative remarks from customers, I am glad that I took a 'risk' with this company that I had not known before. Now I am assured that Massage tools is definitely trustworthy Thanks. this is a great little steamer as long as you have time to refill after each client, which I like to do to keep the water at its freshest. Very pleased with this product. Provides right amount of steam, very easy to operate. The video is also helpful to get you setup for first time use. This steamer is excellent for travel and provides a more than sufficient amount of steam. I also like the option for the extended arm. Great product. I love it!!. It's part of my at home spa experience and fits perfectly on my vanity. Five star product. Produces a GOOD AMOUNT OF STRONG STEAM unlike other facial steamers that you can buy in other places that do not produce any steam. Very happy with the product. I use this product twice a week. I love the results. It helps me with acne. Its one of the best products on the market. And the price is good for such a wonderful product. I recommend this product for others. Out of the box the steamer worked perfectly. My wife loves it and uses it daily. We use demineralized water as recommended and also essential oils ans the ozone light feature. Delivery was prompt and in time for Christmas. Unfortunately for us Canadians, there was duty and a delivery charge but nonetheless, we are very pleased with this product. I absolutely love this steamer. Very sturdy, professional and beautifying! Love this product and I look GRRREAT! easy fast clean dripless, the best steamer I have ever owned, gets alot of attention at the spa, you will be sold out!